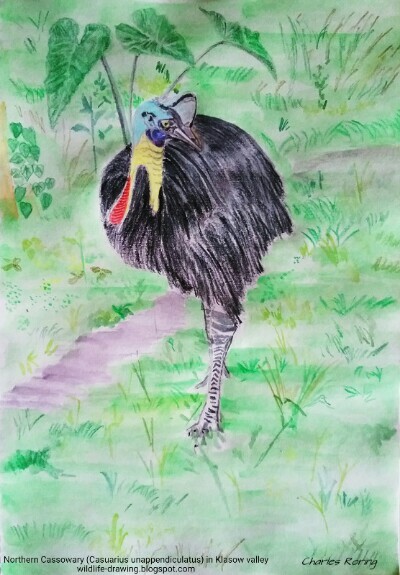 Here is a watercolor painting of Northern Cassowary (Casuarius unappendiculatus) that I saw in the forest near Klabolo river. Wild cassowary bird is a dangerous animal. An adult bird can have a height of approximately 1.3 meters or more. He can give deadliest kicks to his enemy if he feels threatened. This bird eats fruits in the jungle. However, there is an interesting phenomenon that I saw in a jungle village near the river. One day, a cassowary bird enters the village to find fruits. Villagers who saw the bird were afraid but later they gave some bananas to the bird. A few days later, the bird returned to ask more fruits from local people. They gave the fruits again. Now the wild cassowary bird visits the village regularly. Birdwatchers or visitors who go to Klasow valley have got higher chance to see the bird. Sorong city is the main entrance gate for visitors who want to visit Raja Ampat islands. However, not all tourists who come to West Papua are scuba divers. There are also a lot of rainforest lovers and birdwatchers who want to see beautiful birds that live in tropical rainforest. Klasow forest is a good choice. 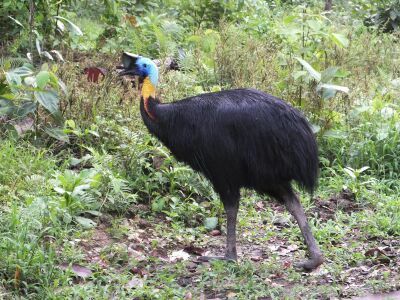 Wild Cassowary bird is considered as a dangerous animal. His kicks are deadly. So, birdwatchers who see the wild animal in the jungle should maintain a safe distance from the bird. However, the case is rather different in Klabolo forest where wild cassowary regularly enters the village to ask food from local people. I used to stand less than 3 meters from the bird and it did not attack me. I did not want to provoke him when I was very close to him. His feet and three sharp claws at each foot looked very strong and dangerous. In addition to Northern Cassowary, visitors who go to Klabolo forest can also watch other birds such as Lesser Birds of Paradise, King Bird of Paradise, Moustached Treeswift, Pinon Imperial Pigeon, Beautiful Fruit Dove, Pink-spotted Fruit Dove, Rufous-bellied Kookaburra, Yellow-billed Kingfisher, Black Lory, Western-crowned pigeon and a lot of other birds in the jungle. There are flowers and butterflies too. Ornithoptera priamus, Taenaris catops, Papilio ulysses are some of the beautiful insects that like to collect nectar from wild flowers in the jungle and the ones that are planted by the villagers. Butterflies like the sweat of human being perhaps because it contains salt. After walking for several kilometers in the jungle, visitors like to sit and take a rest for a while at the bank of a river. If the weather is sunny, visitors will see butterflies flying around and some will land on their skin. It is easy to reach Sorong city. If you are interested in taking a birding and hiking tour vacation in the forest of Klabolo river, you need to fly from your country to Jakarta city (the capital of Indonesia). There are a lot of international airlines that fly to the city. After arriving in Jakarta, you could book a flight to Sorong city. Domestic airlines such as Garuda, Sriwijaya Air, Xpress Air, NAM Air and Travira Air have regular flights to Sorong city. I will be happy to meet you at the airport and organize your trip to Sorong.